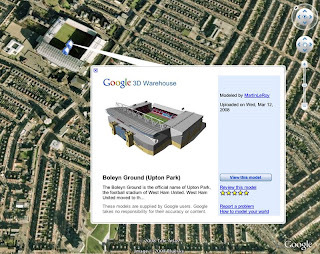 Did you know you can browse 3D Warehouse models in Google Earth? Clicking this 3D Warehouse Community network link launches Google Earth and shows icons wherever geo-located models have been placed in the 3D Warehouse. When you're higher up, you'll see the most popular models; as you zoom in, you'll see more and more appearing. For example, you can see the Eiffel Tower from space, but you can only see this sweet model when you're right on top of it. Thankfully. You can also access the 3D Warehouse Community network link from the 3D Warehouse – just look for the "Browse 3D Warehouse models in Google Earth" link in the upper-right corner of the page. Clicking a model placemark will display an informational bubble about the model and allow you to download the model into Google Earth by clicking the "View this model" button. Try finding the many "Loch Ness monsters" (where you'd expect to find them), or "Godzilla" in Tokyo. What is a "Warehouse"? because my teacher (I'm a CPS student) asked us to make a contribution on this wedsite but she didn't explained to us what in specific she wanted us to learn. What is there to learn about the "Warehouse" and how does it relate to Computer Graphics? I can see you are too quick to judge. What you can learn is to be open to new things, and Sketchup is a great one at that; and just explore as much as you can do, and not just what anyone here can lead you to do and learn. A "warehouse" is a storage facility, and sketchup's warehouse stores resources and models built by and for the Sketchup and GoogleEarth community.